Well, I bought another kit to get a replacement body. This had to come from Japan as there were no local suppliers with any stock. This time I was determined to get it right. Some chance! Actually, it isn't as bad as that but I do seem to be fated with every kit I make to continuously get things wrong. I extracted the body, painted it along with the two lower side skirts. I added the decals and gave it a coat of two pack varnish. I use the Zero-One two pack which gives a tremendous gloss with one coat. Did I say "I added the decals"? Ha! I added the white number circles and that was it. Somehow, I completely forgot to add the rest of the decals. This had a knock on effect which was quite important. 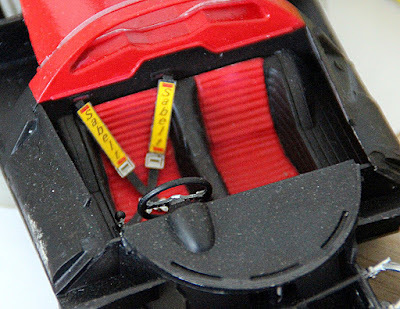 When I realised what I had done, I started to add the rest of the decals and worked out that the door numbers were too far forward as there was only just enough space to get the Ferrari decals onto the door as well. Now, if I had done all of the decals at the same time, I would have noticed this and would have been able to move the number circles. Now they were under a coat of two pack, I wasn't able to do anything. Fortunately, I had left just enough room so I could proceed. Right, that's mess up number one out of the way. With all of the decals in place, I was going to give the body another coat of two pack but it is extremely smelly and a bit complicated to do so I decided that I could leave the body as it was. It is good stuff but you have to measure out varnish, hardener and thinner in the right proportions and, given the toxic smell, I skipped it. The next step was putting the front and real glass into the body. This is where I seriously messed up last time so I was very careful this time. I used my old faithful Gators Grip and not the new thin version and everything turned out OK. 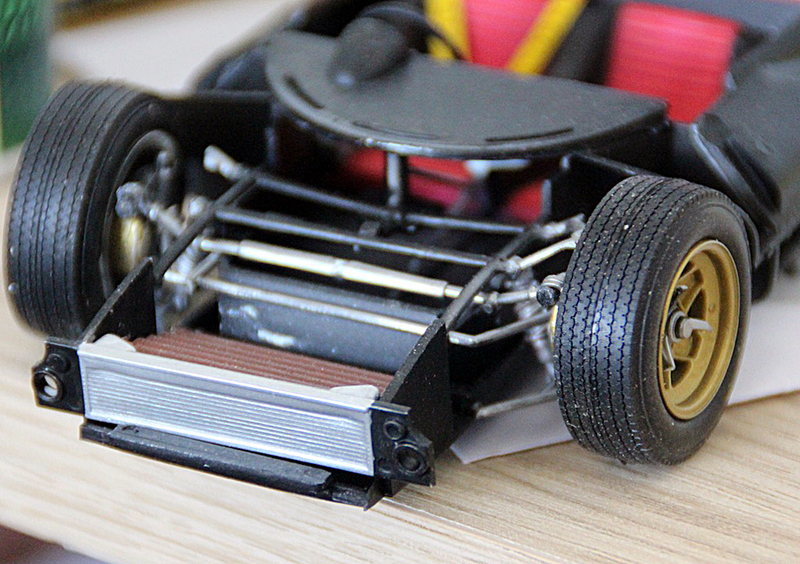 I fitted the body to the chassis and glued the side skirts on.
. The body went back on and the side skirts got glued on - for a second time. I was due to attend the IPMS Ipswich Model Show on Sunday so I created a nice base for the car. 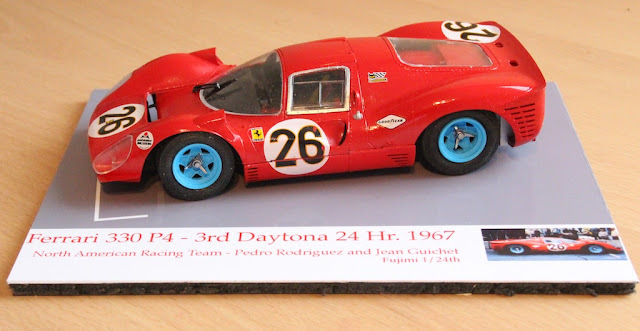 I like to model a specific car and 330 P4 number 26 came in third at the 1967 Daytona 24 hours when driven by Pedro Rodriguez and Jean Guichet so I put this on the base. As I did that, I noticed that the car had blue wheels! I had missed the fact that the car was entered by the North American Racing Team - known as NART - which was owned by the USA concessionaires for Ferrari. 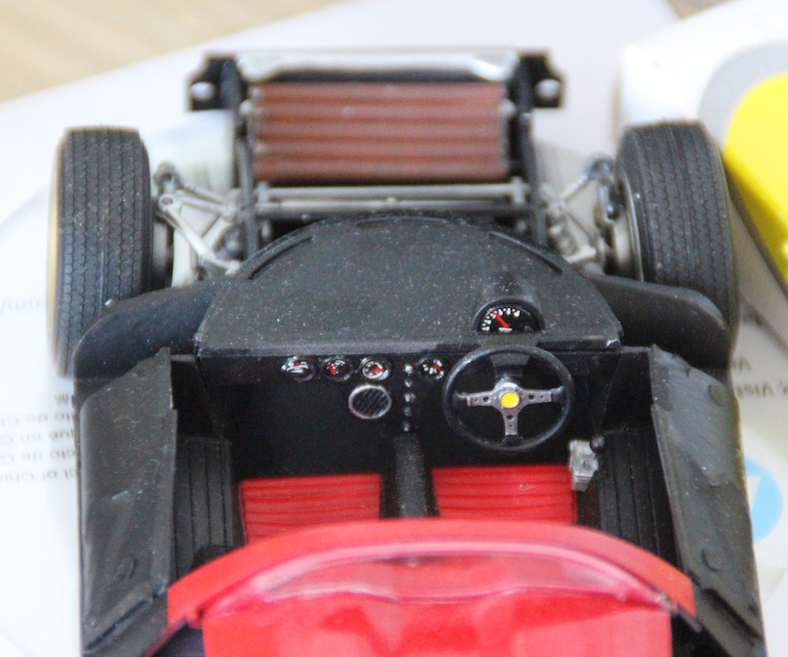 I also noticed that I had failed to paint the holes that held the lights on the front of the car. These should have been silver. The light clusters look a bit odd as they are red throughout! Also, I noticed that the rear glass panel was not correctly fitted and was sitting badly in its frame. Oh well, it was too late to do anything so I took it off to the show. I had a discussion with Bob Rowles of the North Essex Modellers about this and he clearly remembered that there should be some element of blue on a NART car. Today, guess what? I prised the skirts off the body - again - and removed it from the car. Fortunately, the rear glass came out easily with no damage so I was able to reset it in place. I also prised the wheels off the chassis and then removed the tyres. A quick undercoat of white and an airbrush blast of Vallejo Model Air Light Sea Blue gave me the wheels as they should be. I left all of this overnight. I have now put the car back together again. I am not sure if I will do anything about the background to the lights as that might do too much damage to the surrounding body so I may just leave that as it is. Here is the finished model! In this last view, you can see how anaemic the lights look without that silver background. I am just a bit annoyed with myself for all of the stupid errors. Still, I have another 16 kits to practice on. Maybe, one day I will get it right! 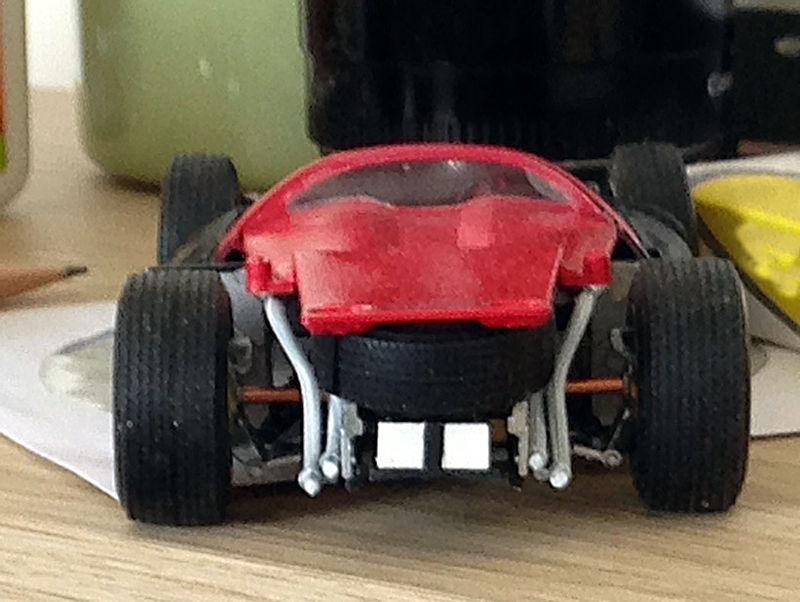 Lastly, here is the actual car, just so that you can confirm the blue wheels - smile. OK, so I managed to keep up my tradition of having "something" on the table at the Clacton model club even if it was only two little 1/144th scale WWII US Navy aircraft. I am back on the Ferrari now. I have painted the new body, sanded it down and painted it again so the surface is pretty much perfect. Tonight, I am in the throes of putting on the decals so, sometime in the next couple of days I will be able to get the 2 Pack varnish on. Then, I have to put the windows in - and that is where it all went wrong last time! Still, we have time for an up to date report of the current model so here goes. 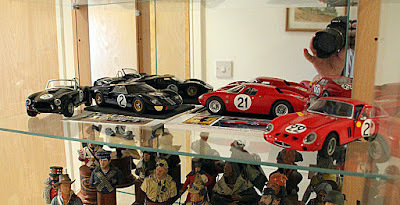 Well, not quite here goes because I wanted to show you my current 1/24th scale car collection in its regular home. This is a glass cabinet with a mirrored back. I couldn't find an angle that didn't have some of me and the camera imposing but never mind. 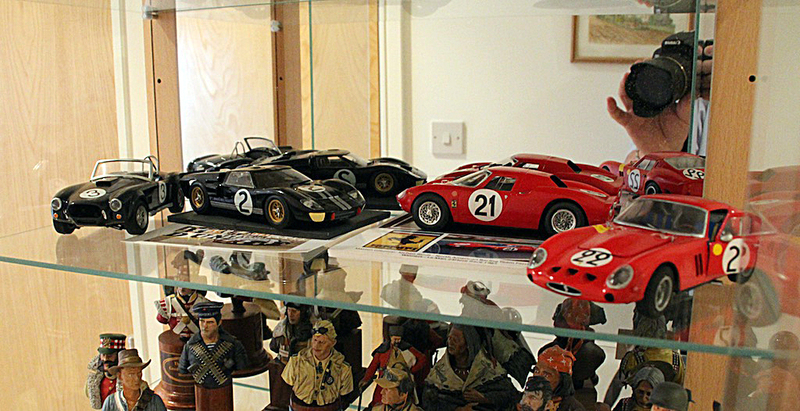 You can just see my collection of 1/10th scale busts on the next shelf down. I am running out of space! More news tomorrow when then MicroSol has dried and the decals are firmly down. 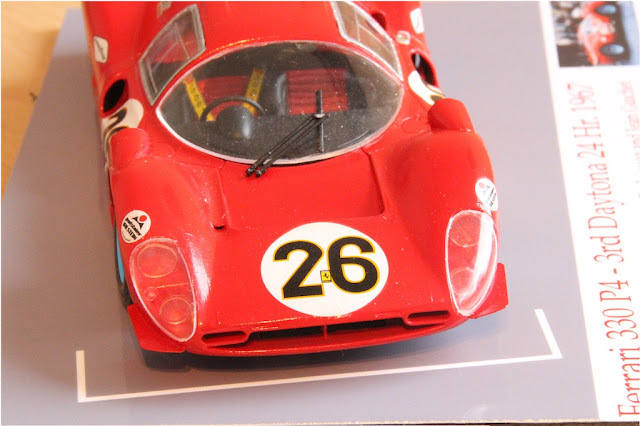 Microsol is a liquid that "melts" the decals and grips them down to the surface of the model. It helps decals sit into complex curves, etc. Before it sets it quite often makes the decals bubble up which normally causes a state of panic but, usually, it all settles down with a perfect finish. So far, I am placing the large racing number circles so we shall see.